Fly Fishing is an excellent way of spending some beautiful time in nature and catching some great fishes. However, without having the proper fly fishing equipment, it can turn into a frustrating experience of getting no fish while spending the whole day behind it. When you have the best fly rods, fly reels, sets of flies and other technical materials ready, then you just have to cast properly to get your desired fish. So, just apart from having patience, it needs good experience of choosing the right gear & for the right place too. Today, we will talk about one of the most demanded fly rod companies, Wild Water. In this article of wild water fly rod review, we will discuss three of the most successful products from Wild Water. Nowadays, a large number of fly rods are available on market place from different brands, but you gotta choose the right one and that is Wild Water. So, without having any delay, let’s dive into the details. Wild Water is a familiar & well-known US-based company. This company is popular for serving a large range of fly fishing product with great variety. This US-based company was founded in 2006 and till now, they are delivering the best quality to their satisfied customers. Not only quantity is something that Wild Water is known for, but also this company has been maintaining an excellent benchmark of quality for all the products they have produced so far. Now it is one of the leading companies for fly fishing equipment in the industry. You can take a quick tour of their web store Wild Water Fly Rod from here. Now to be specific, Wild Water has been really popular among the fly fishing enthusiasts for their superb quality fly fishing rod packages. When we say package, it means the bundle includes pretty much all the necessary fly fishing gears to help you to start without having the trouble of finding each part individually. They don’t only represent a package; these packages are also different in terms of the usability of different users. In this article, we will give you a review of the three best fly fishing packages that Wild Water is renowned for. 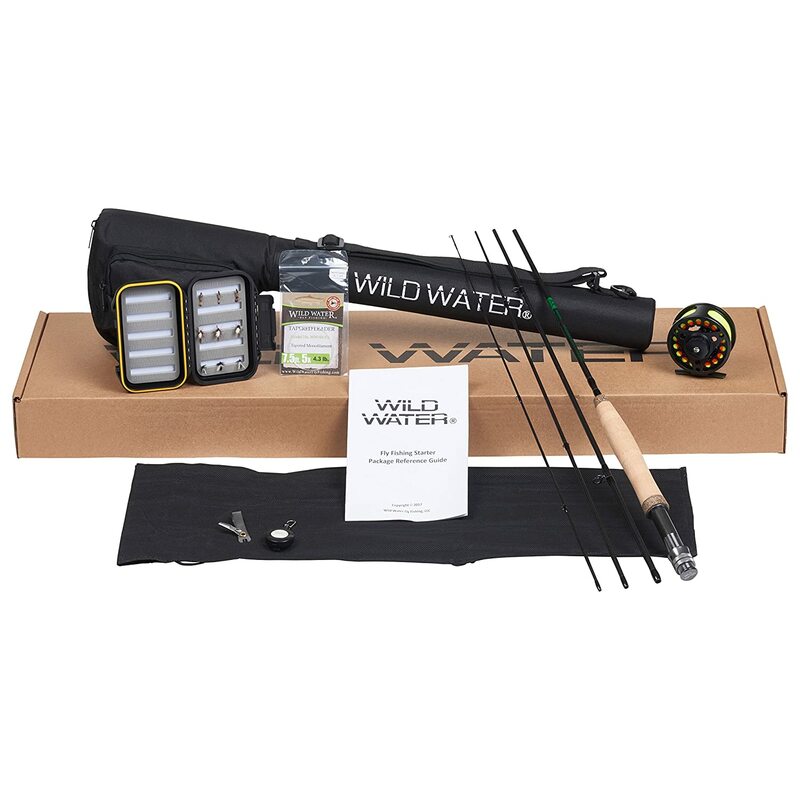 If you are a beginner in fly fishing you can definitely count on Wild Water 5/6 9’ Rod Complete Starter Package. As we mentioned earlier, it is a complete package combining all essential parts of fly fishing and most interestingly, all these parts come in a waterproof floating box. This package includes the best quality materials & various types of flies which enables you to go fishing in different places and catch different fishes. It comes with a user guide which is easy to understand and will help you to prepare your rod for the fishing adventure. Last but not the least, this package comes with a very reasonable price tag which makes it one of the most cost-effective fly fishing packages with awesome quality in the current market. Also considering all the equipment packed in it, it is one of the best fly fishing starter kits in the current market. 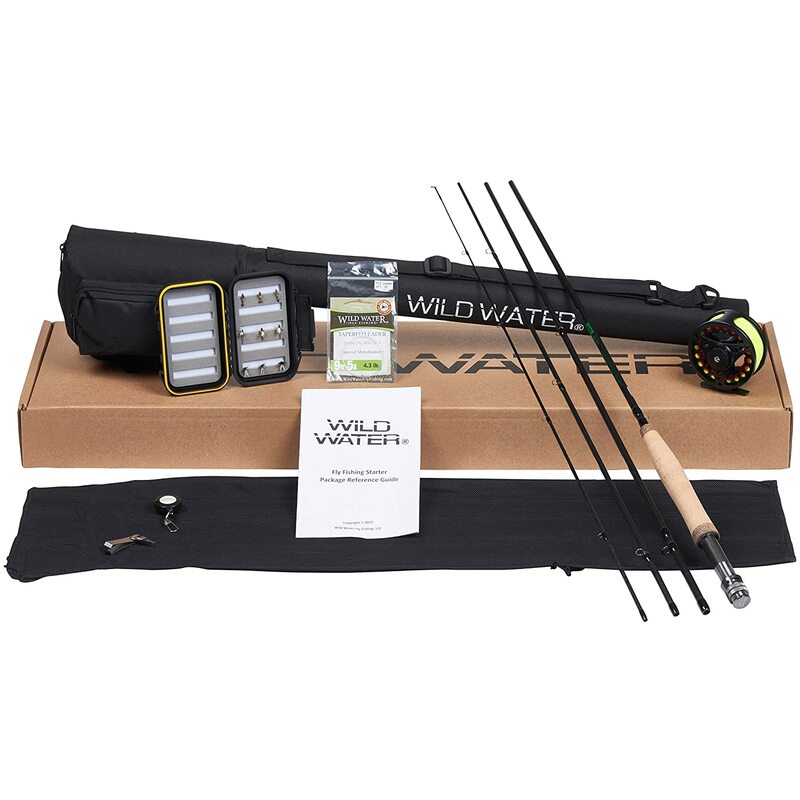 Wild water complete starter package comes with a 9 feet & 5/6 weight rods in 4pcs. It also includes a large arbor fly reel, proper backing & leading, rod sock, rod case & a detailed user’s manual. Wild Water offers a lifetime warranty on their rods. Its reel seat of diecast aluminum & stainless steel ensures the quality even after long term rough use. The rod is accompanied by a fly fishing reel of diecast aluminum which has a large arbor. This reel has pre-loaded 20 pound of backing which comes in blaze orange variant. The fly line used here is a weight forward line with a 5-weight floating feature. Wild Water’s fly box comes with 3 Black Ant, 3 Parachute Adams & 3 Gold Rib Hare Ear that can be frequently used in small stream or pond wherever you want. All these flies are of size 14 which especially suits trout and panfish. Its Waterproof & floating container ensure the safe storage of all essential tools. The stainless material allows you to use it smoothly both in freshwater & salt water. The reel is convertible for both left & right-hand use with a spare leader. The large reel may cause inconsistencies to drag for the beginners. 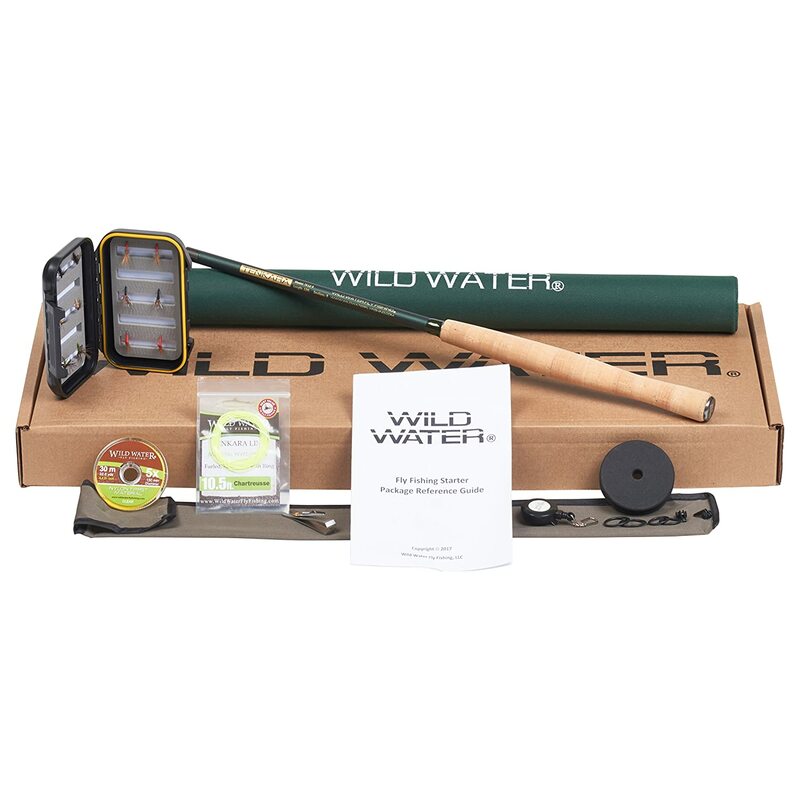 For a beginner, Wild Water Fly fishing Complete Starter Package is a good kit, especially for slow action fishing. Not only for a beginner but also medium level fisherman like it for its variety of equipment & sustainability of accessories. Without any doubt, it can be a good choice for anyone who wants to buy a complete fly fishing package at an affordable price. Tenkara 12 feet Fly Fishing rod is another widely used & popular fly fishing rod from the famous brand Wild Water. From the name itself, we believe you can guess it is 12’ fly fishing rod package. This is a complete package combining all essential fly fishing kits for users. The form of Tenkara fishing was originated 200 years ago in Japan. This is a simple type of fishing that is used in a mountain stream for trout fishing. This process is highly popular among the Japanese freshwater fishermen. This process of fishing includes a very long yet really lightweight fishing rod, preferably made of bamboo so that reaching far away can be easily possible without much hassle. The length of this particular fly rod from Wild Water can resemble the ancient form of fishing, Tenkara. Did You Read: A Perfect List Of Best Fly Rods Of All Time! This package comes with 2 Hen & Hound (Tan), 2 Hi-Vi Kebari (Orange), 2 Sakasa Kebari (Black), 2 Sakasa Kebari (Olive), 2 Killer Kebari (Tan) and 2 Killer Kebari (Black) flies. All of these flies are of size 12 which suits best for trout and panfish fishing in small streams and ponds. As like the previous package, this Tenkara rod package includes a large arbor fly reel, proper backing & leading, rod sock, rod case & a detailed user’s manual. It comes with 12 feet long rod which is divided into total of 9 pieces in the box. Wild Water offers a lifetime warranty on this package too. The tenkara fly rod is a slow action fly rod which has a mid flex IM8 graphite build with an aluminum end cap on the rod handle. For steady grip, this fly rod features a 10” western style grip high-quality cork and cork trim rings. To provide excellent support to the rod, it features a 10.5’ furled level line with chartreuse which ensures high visibility. Worried about carrying the fly lines when walking? Don’t you worry. 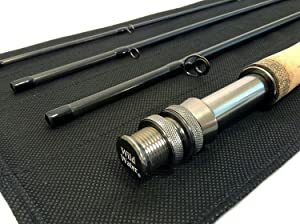 Wild Water Tenkara Fly Fishing Rod package features an EVA foam spool to store your fishing line. Its waterproof floating fly box can hold up to 372 flies & it comes with 12 Tenkara flies. This package also includes essential accessories like tippet, zinger, knot tying tools & other. This package contains a 12’ long rods for greater reach. Strong and steady build of the fishing rod for slow action fly fishing experience. Lifetime warranty on the whole package. Well protected waterproof and floating fly box. Excellent fly line for good catches. The kit comes with a knot tying tool which will come handy for tying different fishing knots. The spool can be bit inconvenient for the users who are not familiar with Ancient Tenkara Fishing. For a beginner, the package is a bit difficult to assemble. For both beginners and experienced, Wild Water Tenkara Fly Fishing Rod can be a good choice to afford for fishing in slow action. Its unique style makes it different from other Wild Water fly fishing rods. It is specially made for travelers and backpackers who would like to reach great distance without much hassle to catch fishes. Like other Wild Water products, you can count on its quality for a great fishing experience. This Wild Water package is quite alike the 5/6 9’ complete package. It comes with the 7 feet fly fishing rod that can be assembled from the 4pcs of rods given inside the package. Although this slow action fly fishing rod has a length of 7 feet, but surely it ensures better handy use & control. It is a lightweight rod which comes with an excellent gripped handle which enables the user to enjoy the fishing more conveniently. All the tools included this package are bundled in a waterproof box that ensures the safe storage of the fishing accessories regardless of being in indoor or outdoor. This package comes with a 7 feet rod of 3/4 weight. As like the Tenkara fly rod, this slow action rod also comes with IM8 graphite mid flex build with reel seat, stainless steel snake guides and hook keeper. The handle is covered with a compressed cork of high quality that ensures steady controlling for users. Its fly box includes 3 of Black Ant, 3 of Parachute Adam and 3 of Gold Rib Hare Ear Nymph. All these flies come with a size of 14 and these flies suit best for trout or panfish fishing in small streams or ponds. This fly rod features a fly fishing reel of diecast aluminum. It comes with a preloaded 20-pound of the backing of weight forward fly line of 3-weight and 7.5’ leaders. More specifically, the fly reel has an aluminum spool, stainless steel internal components, quick release spool, and disc dragging system for fine adjustment. Not suitable to use in rough stream fishing. Can be inconvenient for big fish catching. For a genuine starter even for kids, this 7 feet fly fishing rod package will be one of the best choices to start fly fishing. It is really easy to control & handy to use. Besides, its all accessories are made of high-quality material which is a trademark of Wild Water. So, from a beginner to experienced players, everyone can depend on it. Fly Fishing is a passion and to maintain you, you need the right instrument right beside you. Most of the time for low-quality gear we fail to catch some magnificent fishes, let alone the money we wasted on the poor quality items. To avoid those frustrating moments, without even thinking a moment more, Wild Water can be a great choice. This company has been serving with a quality product at a reasonable price for a long period of time. It means they are really good at it which is visible from their customer satisfaction. They served their customer base with a lifetime warranty on their Fly Fishing Rods. It shows how confident they are about their product quality. We believe, this wild water fly rod review article has provided you a proper direction of which fly rod to get for yourself. Yet if you have any further question, hit the comment box below and we will be right with you for any sort of assistance. Must Buy Best Fly Fishing Combo Under 300!